If you have ever attempted a vintage pattern, you know how difficult this challenge is! Vintage patterns often have pleats, darts, collars, and gathering. But let's not forget the curve ball of sizing and fitting! For this challenge they were able to choose their own pattern and materials. Vintage patterns can be found online or at yard sales/estate sales and thrift shops. The pattern must be at least 20 years old to be considered vintage. We gave our seamstresses 2 weeks to complete this challenge encouraging them to take their time to really focus on perfecting the fit and details of their garment. Vote for your favorite design at the bottom of this post! I was really excited to get to sew up one of my vintage patterns from my stash. 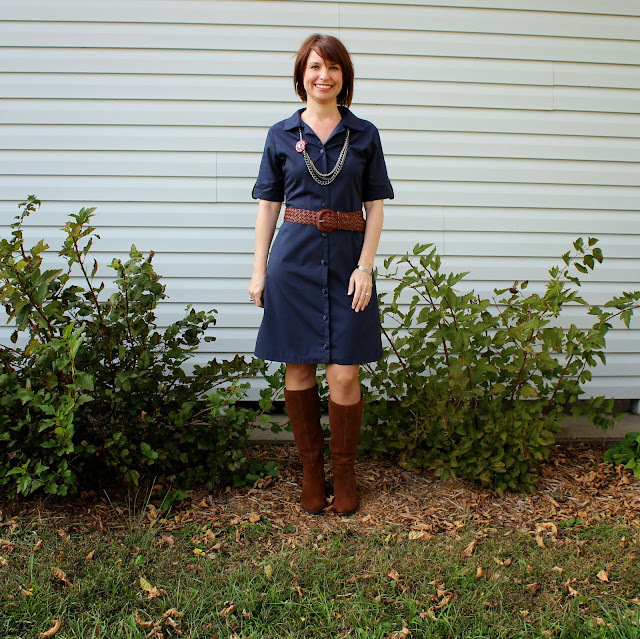 I chose McCall's 2282 from 1970 because it had the same feel of a navy blue shirt dress I had seen on Pinterest that I had pinned to my Inspiration board (and let me tell ya how exciting to finally sew up some of that pinned inspiration!). Also I would like to convey how hard it was for me to stick with the solid navy blue fabric I chose. I will always pick a print over a solid. I even sewed up my muslin in a print and had to talk myself into NOT finishing it and submitting it as the finished product. I made my own personal challenge of a sewing a solid for this project as my wardrobe is really lacking. I always feel so uniform in solid colors but after wearing this dress I've learned it's all in the styling. Solids are very versatile and I can't wait to make more! To recreate my Pinterest inspiration I modified my pattern by extending the button placket, as you can see the original button placket stops just below the waist as one version is a pant dress. I also eliminated the side panels, altered the back piece to cut on the fold of fabric (I didn't want a CB seam), narrowed the sleeves and added faux sleeve cuffs and self drafted sleeve tabs. After a tissue fitting I determined I also needed to narrow the shoulders and shorten the waistline. I also added back contour darts to get a slimmer fit. The fabric I chose is a Donna Karan cotton. It's unnoticeable in these pictures but there is a very subtle tone on tone polka dot pattern in the fabric. The fabric was also rather sheer and because of this I chose to fully line the dress, luckily I had just enough fabric. I have a feeling this dress will be in heavy rotation in my closet. It's very comfortable to wear and can be styled so many ways. Perfect for the changing temps. In the Fall I can pair it with a chunky scarf and boots and in the Spring a statement necklace and some flats. And I never forget a belt. As always check out my blog for pictures of the inspiration dress and a closer look at the fabric. 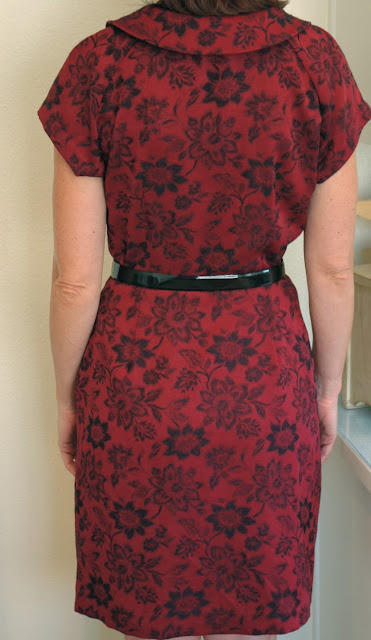 This pattern features 6 shoulder tucks (not gathers, but carefully positioned tucks), two side seam bust darts (that I added), two back shoulder darts, two back waist darts, and the skirt has six pleats into the front bodice. The pattern also features 3 darts in the back of each sleeve (above the hem), ruching at the hem of the sleeve, and side seam pockets. Such lovely, classic details! I knew that this would be a flattering silhouette for my large bust. Other than the changes I made for the fit (adding bust darts, widening the waist, narrowing the shoulders, lengthening center front of the bodice), I made the pattern exactly as designed. I modernized the pattern by using a modern fabric. This fabric is a beefy neoprene-like knit - a very stable knit, and features an animal-like texture. This fabric handled the tucks, darts and pleats beautifully. I have never considered myself a "vintage" girl. 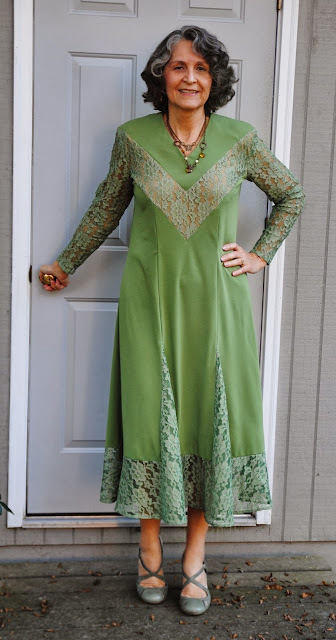 I was born in the late 50s, so it seemed a bit weird, at first, to sew clothing like my mother used to wear (I draw the line at the girdle or its modern equivalent, Spanx), but I'm sold! I can see sewing more vintage patterns. They are beautifully drafted and include such interesting details that modern patterns lack. For more information about my process (including the failed dress) and a lot more pictures, see my blog. 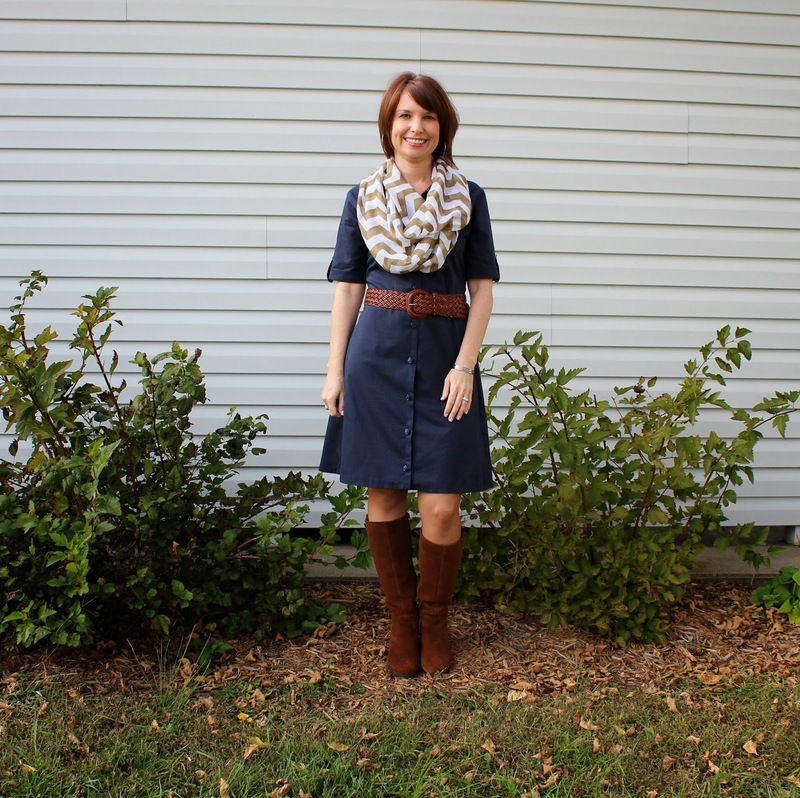 For this challenge, I chose an early sixties "wiggle dress" pattern that is beautifully classic yet still modern. I'm not a sewer to sew something for sewing's sake, so it was important to choose something that I want to wear. I pulled this black and crimson rayon blend brocade out of my stash and thought it was the perfect (and thankfully softer and drapier) homage to the brocades of the sixties. One of my favorite parts of this challenge was opening the pattern. All of the pieces were there and had been meticulously cut and marked by the previous seamstress. I know it's nerdy but it made me happy to use a pattern that someone else had taken such care with. It's nice to be part of the sewing tradition. Fit is one of the criteria for judging so I took my time grading the pattern up and making sure it fit well. I lowered the neckline, widened the collar and made a slight aline skirt with darts instead of a straight skirt with pleats (more flattering on me.) I put in a side seam invisible zipper and shortened the sleeve from the original pattern. For detail, I added a front placket with peau de soie piping and covered buttons. I matched the fabric on both fronts and placket so the entire bodice is one continuous design. Although I made all of these changes I still feel that I stayed true to the "wiggle dress" feeling of the pattern while making the dress wearable for me. For more information and photos please visit my blog. Peter Pan collars are everywhere right now, but I was surprised to see one on a 1953 McCall's pattern at my local antique fair. Doing a little more research, I found that that the style has been around since at least 1905, and popular almost every decade since! After adjusting for fit (and making at least 6 muslins!) I sewed up the pattern as intended, leaving in all the original darts, tucks and details and only adjusting the hem length. To make the dress look young and fresh almost sixty years after it was originally published, I used a dark sequined fabric fro the collar and incorporated bright colors in both the dress and styling. The pattern also includes a side zipper, button placket down the front, and lined cuffs designed to be folded up. Even though the pattern is straight out of the 1950s, I could totally see myself wearing this to the company holiday party or a fun night out! 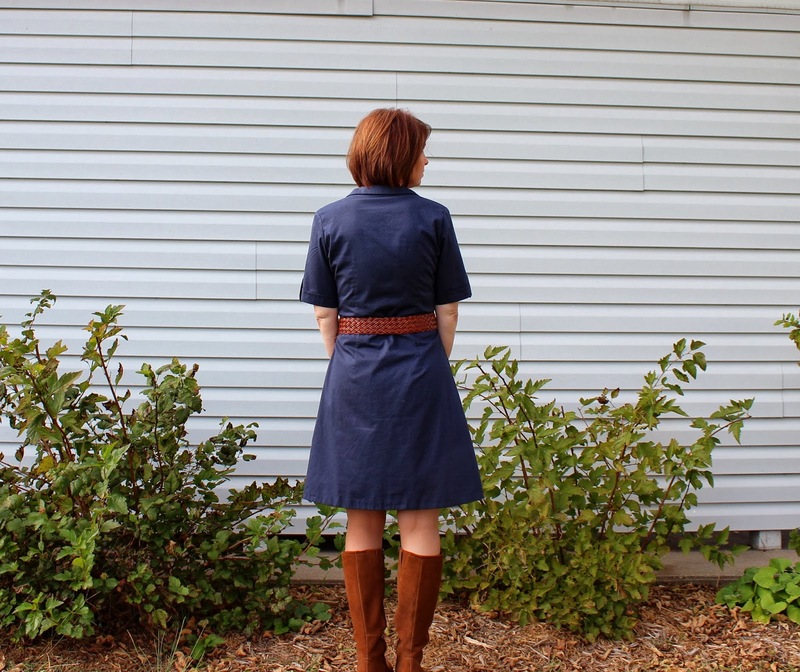 I chose a 1943 wrap shirt dress pattern from DuBarry. It was wartime-- women were rationing, working with what they had and keeping it simple when this pattern was sold for 15 cents at Woolworth. Clean lines, a feminine shape and a smart style led me to make this World War II era garment. To update the pattern, I shortened the hem by about 7 inches and the sleeve length about 4 inches. I also decreased the very loose look of the bust by removing the extra material and pleating in front and skipped the shoulder pads. I used red & white polka dot cotton poplin for the bodice and a navy blue linen & silk for the skirt. I added a cotton lining to the skirt and underlined the waistband and collar for structure. I used all vintage notions. I hand sewed all stitching that would be apparent on the outside. To see my process and loads more images check out my blog Kathy Sews. ﻿I love the clothes of the 1930’s. The linear silhouettes with lots of style details and seaming. The pattern for the dress I made is from a 1931 issues of a German sewing magazine called Praktische Damen und Kinder Mode - Practical Women's and Children's Fashions. The patterns in this magazine are offered in only one size and have to be traced from an insert. I can’t read German, so I referenced several sewing books published in 1927 and 1935 for instructions on the unique features of this dress, the godets and narrow sleeve with a long dart from wrist to elbow. 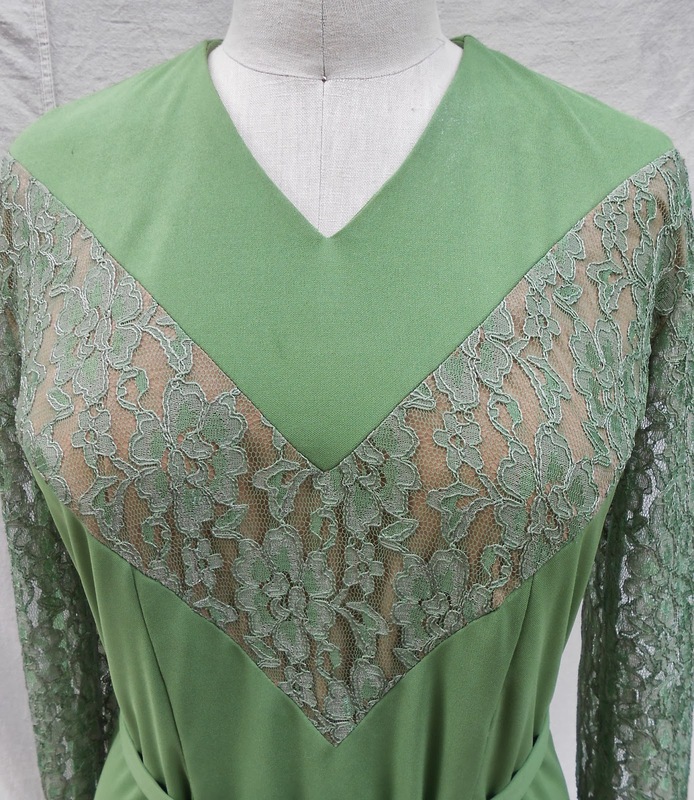 The dress has V shaped lace inset in the bodice, lace sleeves and a lace skirt border with godets, which echo the angular lines of the bodice inset. The fabrics used are a mint green poly blend knit and matching lace. The lace insert in the bodice is lined, all other lace pieces are not. These are all amazing seamstresses! I greatly appreciate all the time and effort (and muslins!) that have gone into creating these pieces. Really, all the dresses this round were superbly done and the choice of a single winner here, is harder than in the other rounds. Kudos to all . . .
Once again it is hard to choose a winner - they all look so good and are so different from each other. Well done ladies! This piece is timeless... and flatters almost every body. Seriously considering making one of my own.